This cologne bottle was produced by New Martinsville during the 1930's. 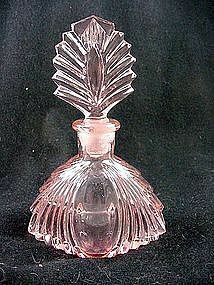 The shape is listed as the #18/2 cologne bottle. I have 2 available, both are in excellent condition. Price is per bottle. See my other listings for more Depression Era Dresser items. Moondrops was produced by New Martinsville Company from 1932 to 1940. 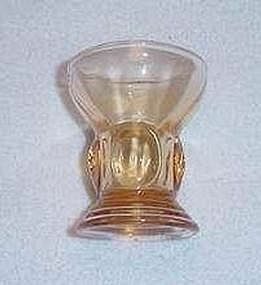 Offered here is the 5 1/8 inch wine goblet with the chrome stem. The glass screws into the base - makes for easy cleaning and storage. Excellent condition. 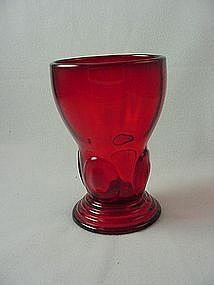 The glass is a rich, ruby red color - my camera has problems with reds, sorry for the slight blurriness. See my other listings for more in this pattern. Moondrops was produced by New Martinsville Company from 1932 to 1940. 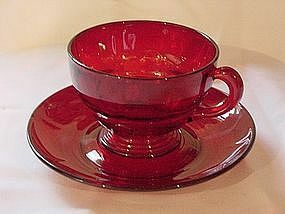 Offered here is the cup & saucer set in perfect condition. 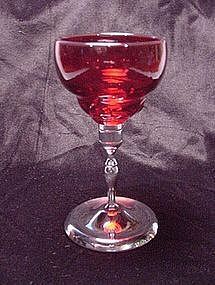 The glass is a rich, ruby red color - my camera has problems with reds, sorry for the slight blurriness. Price is per set, I have 10 available. See my other listings for more in this pattern.